If you already read Harry Potter and the Deathly Hallows then you know that “The Tales of Beedle the Bard” was the book left by Albus Dumbledore for Hermione to decipher. 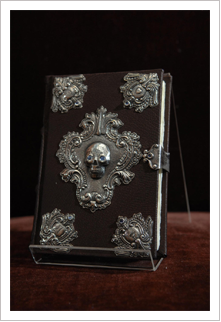 And though the whole Harry Potter Series is said to be non-fiction, the book “The Tales of Beedle the Bard” really exists. As a matter of fact there were only seven copies of this book ever produce and each books were intricately handwritten and illustrated by the bard herself, Ms. J.K. Rowling , the renowned author and creator of the whole Harry Potter Series. The said books were auctioned at Sotheby’s in London earlier this month and Amazon.com who spent a whooping $4,000,000 (£1,950,000) is among the proud owner of these precious (and expensive!) books. Proceeds from the auction will be donating by Ms. Rowling to a charity she co-founded. So what are the tales of Beedle the Bard? As much as I want this book for Christmas, I don’t think that’s ever possible. Gawd! This is probably the most expensive book I’ve ever seen! Oh well, I hope that Ms. Rowling will sood decide to publish a cheaper (way cheaper!) version of this book and I bet a lot of HP Fans will be delighted.